Karl Kraus (April 28, 1874 – June 12, 1936) was an Austrian writer and journalist, known as asatirist, essayist, aphorist, playwright and poet. He directed his satire at the press, German culture, and German and Austrian politics. The Austrian author Stefan Zweig once called Kraus "the master of venomous ridicule" (der Meister des giftigen Spotts). 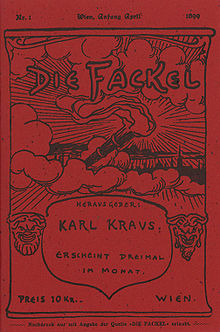 On April 1, 1899, Kraus renounced Judaism, and in the same year he founded his own newspaper, Die Fackel (de) (The Torch), which he continued to direct, publish, and write until his death, and from which he launched his attacks on hypocrisy, psychoanalysis, corruption of theHabsburg empire, nationalism of the pan-German movement, laissez-faire economic policies, and numerous other subjects.